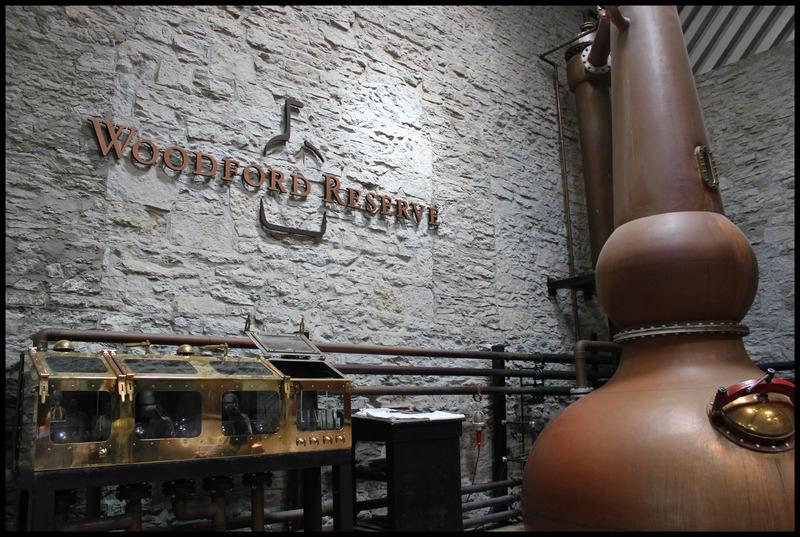 Origin: Distillery building erected in 1838; rechristened Woodford Reserve in 1996. It’s 10 miles of road between downtown Frankfort and the Woodford Reserve Distillery, but it takes about 25 minutes to drive it, and that’s if you don’t get lost. Beautiful as it is, these people need to work on their signage. It’s all rolling country, bluegrass (I think) and horse farms, and like so many of the others, the verdant, pastoral homogeny gives way suddenly and without warning to a distillery that sees a couple hundred thousand visitors every year. 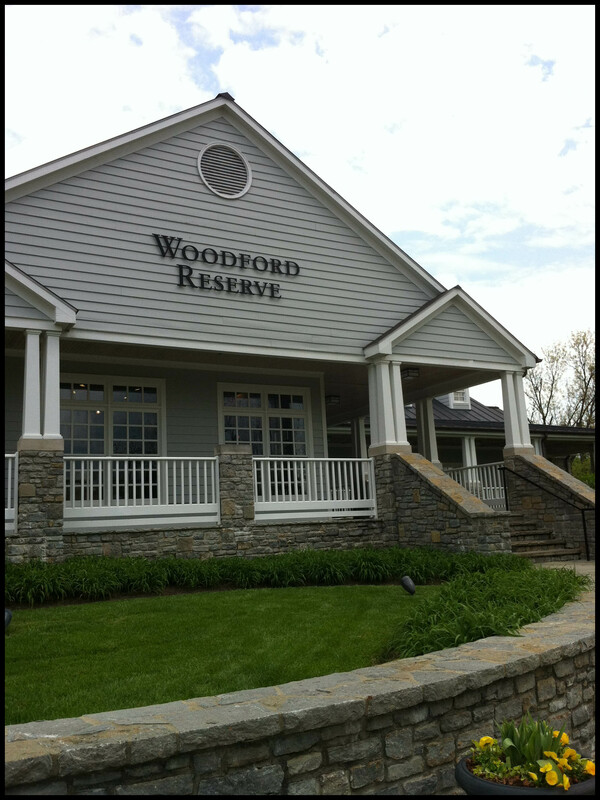 The Woodford Reserve visitor’s center is nice to the point of strangeness, particularly compared to all the others. It feels like Napa, but upper-crust Napa. If Jim Beam is Mondavi, then Woodford Reserve is Opus One. 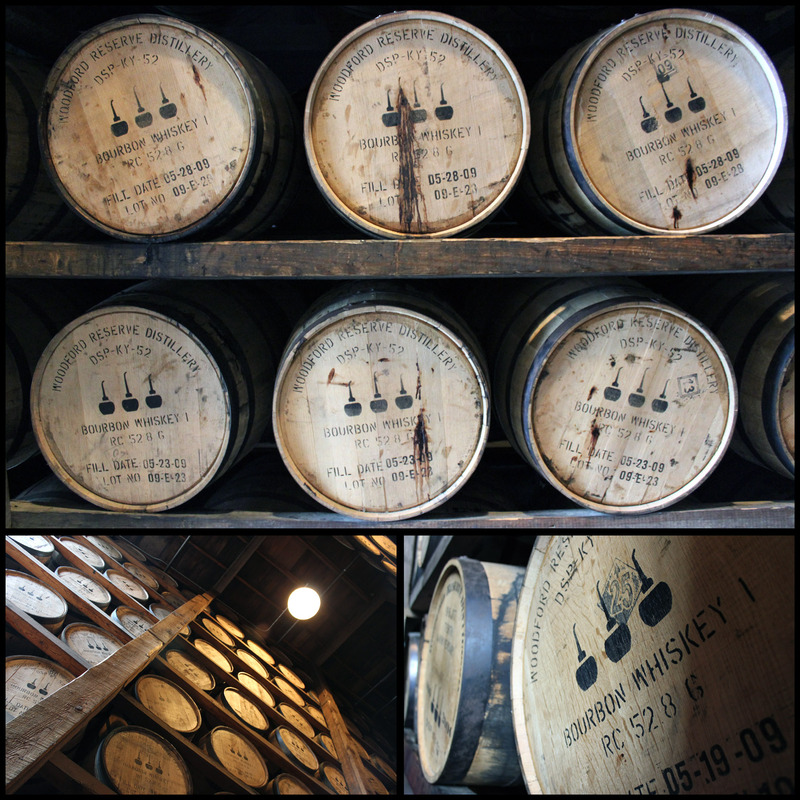 The immediate impression is one of slick corporate professionalism, and it’s no mystery why: Woodford is owned by Brown Foreman which makes it brothers to Jack Daniels, and though it’s the smallest distillery we saw — indeed, one of the smallest in Kentucky — you can feel the money in the walls. It’s all scrubbed rocks and the perfectly placed tree, the visitor’s center clean and well kept, with expensive looking infographics on the bourbon process and a pleasant lunch stand in the corner selling sloppy joes made from all natural grass-fed beef. None of this is a bad thing, it just stands in sharp relief to the rest. Woodford Reserve is small but is also the most polished, and reminds me of the cold perfection of a museum, or your rich uncle’s living room that was always really clean and you were never allowed to touch anything. They’re also ostensibly comfortable with being the only distillery in Kentucky to charge money for the basic tour: a reasonable, if still puzzling, $5. I don’t know why they do, or why the others don’t, but it’s a somewhat inauspicious title to hold. The tour begins as we’re loaded on a small bus that takes us less than 100 feet down a small hill. The buildings are terribly handsome: old, speckled stone that wear their age with dignity, and one is tempted to refer to the grounds as a “manor” rather than a factory. But there were nonetheless telltale signs that people actually work there — in our case, the newly filled barrels being rolled into the aging warehouse. Those barrels weigh over 500 pounds and yet one person can easily move them, illustrating one of the many benefits of the circle. The distillery building is squat and long, old stone and wide passages with mash, fermentation, and distillation all taking place within 50 feet of each other. Entering leads directly to the mash exhibit: with the exception of some experimental bottlings and the “Double Oaked” that might gain traction, Woodford Reserve essentially makes one product, and unlike most, they are more than happy to tell you their exact mashbill. Their particular ratio is 72% local corn, 18% Dakota rye, and 10% Milwaukee barley. Woodford keeps some of the smallest fermenting tanks in the business. Also unusual is that, like Maker’s Mark, they’re made from cypress wood as opposed to stainless steel. Cypress is chosen for its locality, and doubly because it is inert (adds nothing to the flavor of the mash) and virtually immune to water, with tanks lasting 100 years or more. Every once in a while I’ll hear someone say that stainless steel somehow adds a metallic flavor to the mash, but I don’t buy it and Woodford doesn’t claim it — cypress wood is merely traditional. Plus, it looks cool. 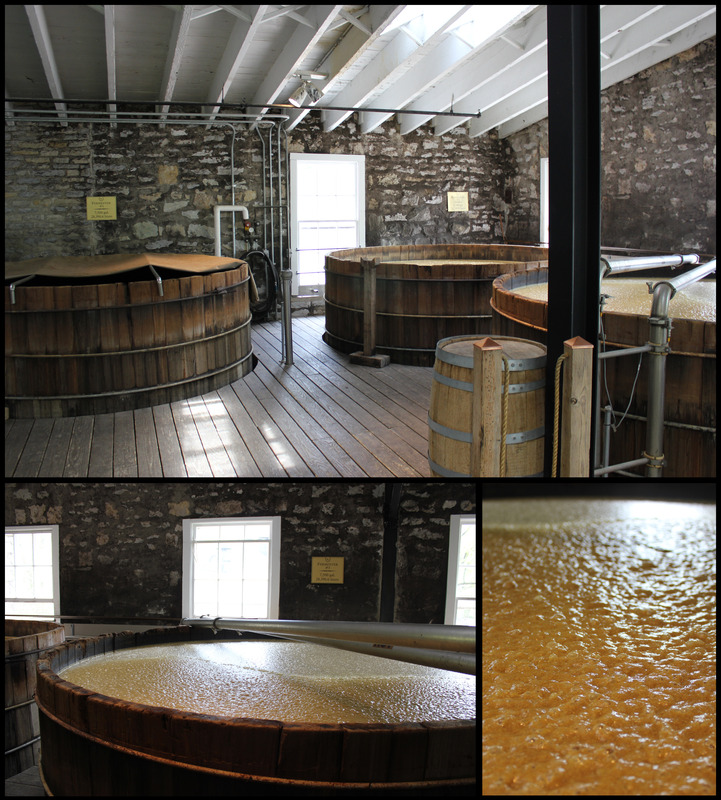 In 7500 gallon tanks, they use 400 gallons of sour mash, or 5% of the total. 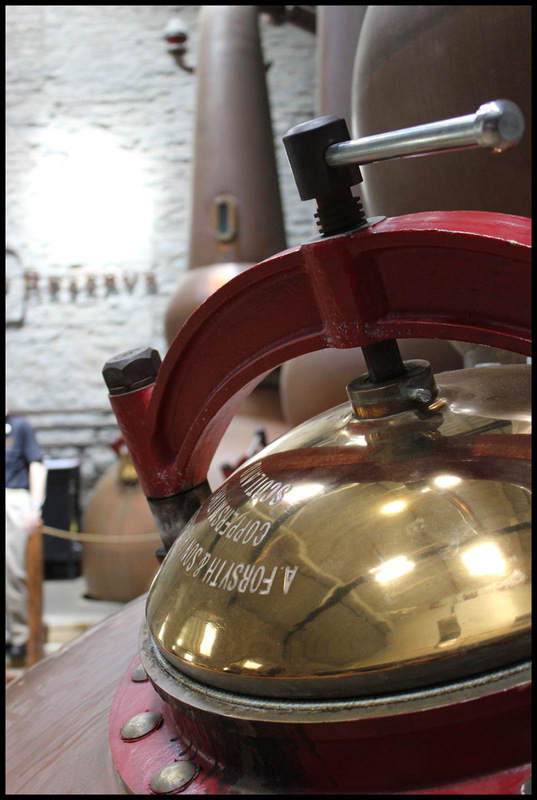 Like the others, it is distilled up to 9% in a process that takes between 3 and 7 days. We were instructed for some reason to stay at least 3 feet back from the tanks, but Vikki, camera in hand, bravely ignored them for the sake of the art. Woodford Reserve is, as far as I know, unique among mass-produced bourbons in that they exclusively use copper pot stills, an attractive trio imported from Scotland to occupy the far wall of the distillation room. Again, this was another time when I forgot I was standing in a working distillery. Everything is so clean and neat, I only remembered when I leaned against the spirits still and found that — like most copper pots with large fires under them — it was incredibly hot. The first still in the corner, called the Beer Still, holds 2500 gallons and takes the distiller’s beer up to 40 proof. That distillate is then pumped into the middle one, the 1650 gallon High Wine Still, which brings it up to 110 proof, which in turn goes into the final, 1650 gallon Spirits Still, which takes the distillate up to 158 proof, just 1% lower than the upper limit of what is allowed, by law, to be called bourbon. Generally speaking, the higher proof to which you distill, the more flavors you remove. Some of these are bad flavors, but some are good. That rule taken to it’s logical conclusion gives us vodka, distilled as high as 195 proof and tasting as close to nothing as is scientifically possible. 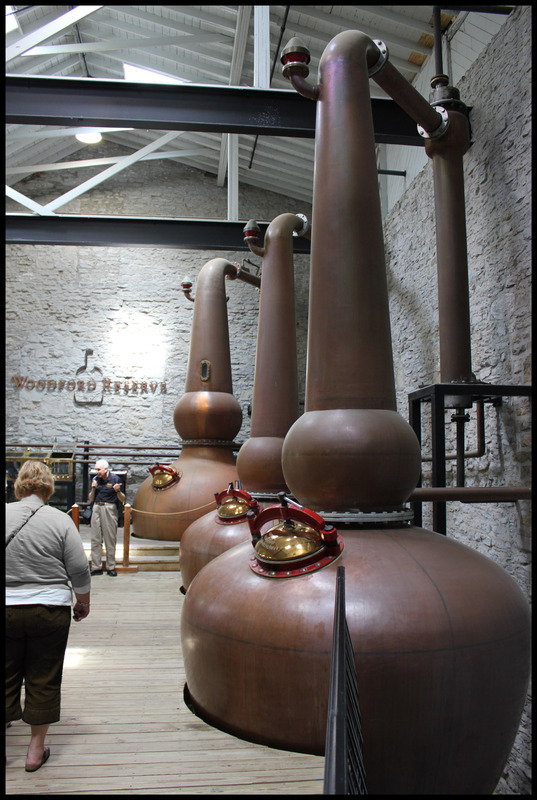 So Woodford Reserve’s high proof distillation helps to explain its relatively mild taste. Again, not better or worse, just a choice in production. 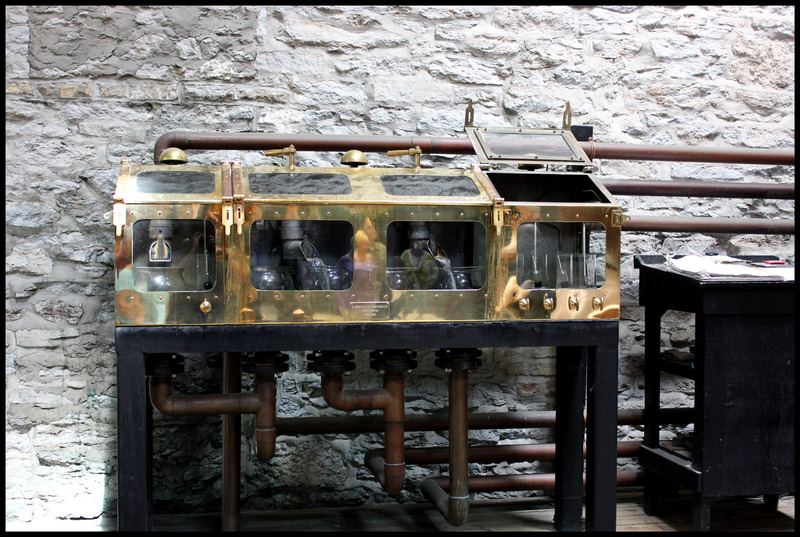 And where Buffalo Trace had a novelty barrel and a Buffalo head tap handle, Woodford Reserve ropes off a stately, gilded spirit safe pouring the white dog into holding tanks, where it prepares itself for barreling. All their whiskey is aged in wood that has been air dried for 9 months, a laborious but superior process to the quick & dirty kiln drying some others do. 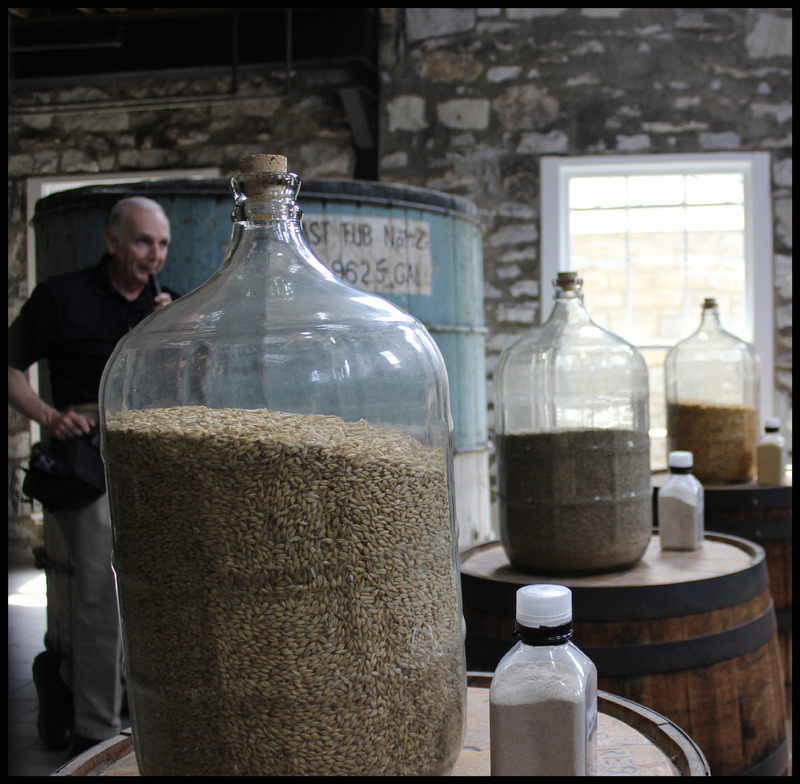 The tour guide didn’t have the slightest problem telling me the exact mashbill and precisely how much of the fermentation is sour mash, but when I asked about the char level on the barrels, he responded as if I had asked him the size of his sister’s waist. All I could glean is that the barrels see a heavy char, between 3 and 4 on a 0-4 scale, which is pretty standard. What’s uncommon is that their barrels are toasted before they’re charred, a small step but one that helps explain the heavy vanilla and butterscotch flavors in the final product. They take the 158 proof spirit and add distilled water (they call this watering down “gauging,” the first and last time I heard that word on our trip) until the spirit is down to 110 proof, at which point the whiskey is put it into barrel and sent up to it’s lengthy silent detention. 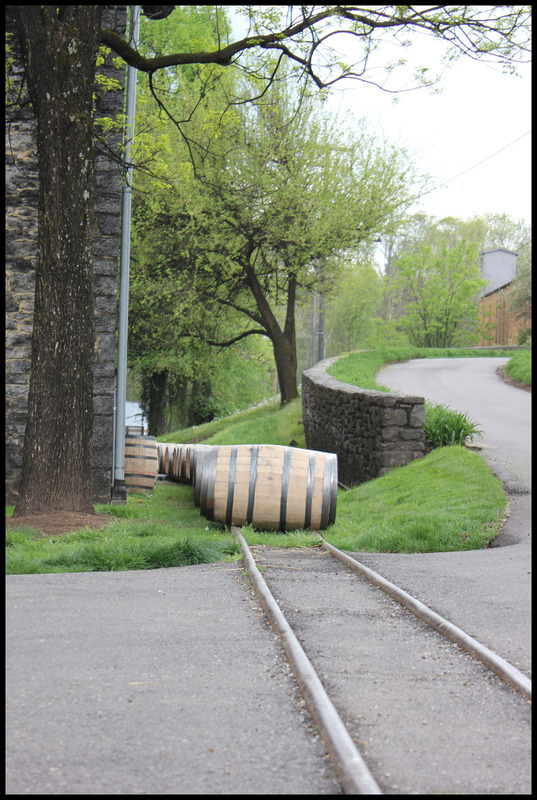 All the Woodford Reserve anyone has ever had comes from but one modestly sized warehouse, sitting just short roll from the distillation room. The general solemnity of these buildings were somewhat disturbed by the 30 or so pairs of feet shuffling their way through, but there was still plenty of the angel’s share to go around. 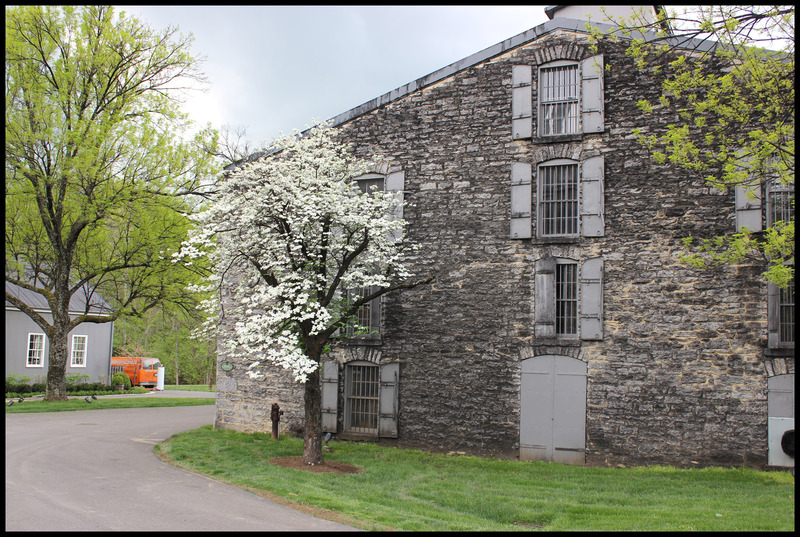 Like Buffalo Trace, Woodford Reserve’s warehouse is heated, to hasten the aging of the spirit in the winter. The barrels are not moved once they land in their appointed rick, and depending on their location they linger for between 7 and 9 years, at which point they are removed, batched (“blended” means something else in Whiskey World, so mixing barrels is not blending, or so we were prematurely admonished… it is batching), bottled, and sold as Woodford Reserve. 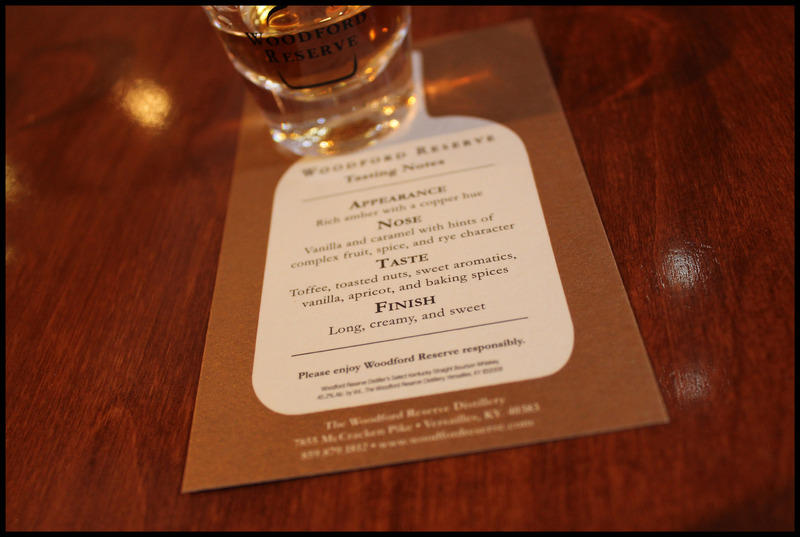 Woodford Reserve is bottled at 90.4 proof (45.2% ABV), but it doesn’t taste it. It is smooth enough that I’d recommend it to fans of Jameson aiming for a bit more patriotism in their drinking habits, although it’s much sweeter, with more going on. I kind of can’t believe their little tasting card didn’t mention butterscotch, as the taste, to me, is a full blast of butterscotch candy, with vanilla and maple notes supplementing. While an 18% rye could be called relatively high, the inherent spice of the rye is batted down by the high proof distillation, and the rye flavors seem to hide behind bitter oak tannins on the finish. The rye comes on the exhale. The Woodford Reserve “Double Oaked” is a new release that may become part of the permanent line-up, in which they finish Woodford Reserve in a second new oak barrel, this one heavily toasted and lightly charred. The effect of this is even more butterscotch and vanilla flavors, and as such I find it a bit redundant. It is, however, an interesting lesson on the effect of toasted wood to taste them side by side. Overall, I think Woodford Reserve is a solid bourbon with well integrated flavors. The candied flavors may be too much for some, but I think there’s a place for that. My complaint is that I wish they didn’t distill it so high because the lightness of body, for me, makes it rich without being full. Nonetheless, it remains a tasty bourbon that I would always graciously accept. Bottom line: I always enjoy it, but I never seek it out.